From the moment you arrive on campus, our vibrant student leaders and friendly staff members will welcome you into the Brandeis community. The first people you see will be the volunteer Orientation Leaders, who will serve as your guides, resources, and mentors throughout Orientation and beyond. Upon your arrival, it is likely that some of the first items on your to-do list include a visit to the Brandeis Bookstore, last-minute shopping, and selecting a local bank. 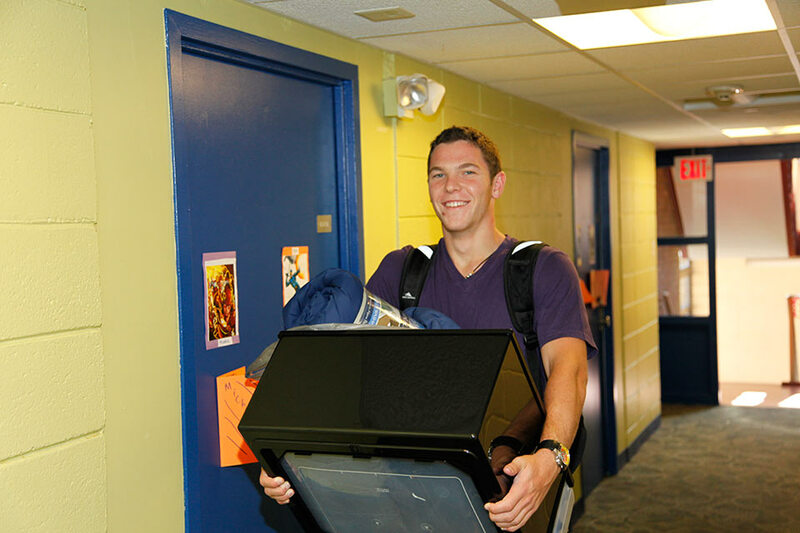 Save money on textbooks and simplify your move-in by purchasing or renting your textbooks through the Brandeis Bookstore. Students who purchase their books through the bookstore's website get first access to used books. Since the bookstore staff works directly with professors, you'll be sure to have the right books for your classes. It is advisable to select in-store pickup for several reasons. In-store pickup orders are pulled when the used book inventory is at its highest, which will result in more used books for your order. You will also save money by avoiding shipping costs, and move-in is simplified because your books are already here. These books will be available for pick-up starting on Opening Sunday and through the first week of classes. The Brandeis Bookstore can take care of many of your last-minute purchases, from bedding to extension cords to everything in between. It also carries all the necessary school supplies for classes. On move-in days in August, representatives from Bank of America, Citizens Bank, Santander Bank, and Webster Bank will be available to assist you in opening a bank account. International students can open an account with a passport and a Brandeis student ID. Please note that students who have been awarded a Federal Work-Study or University Employment allotment as part of their financial aid package have priority for campus jobs until October 1. Students who were not awarded these funds are ineligible for employment until after this date. If you have not yet filed an application for financial aid and would like to do so, please visit the Office of Student Financial Services website for more information. International students may be eligible to work on campus while maintaining full-time student status at Brandeis. Eligibility for working on campus will be discussed during the International Student Pre-Orientation Program. Please contact the Office of Student Financial Services at 781-736-3700 or email sfs@brandeis.edu with any questions or concerns regarding Student Employment. You can learn more at our information session during Orientation. All students must have a Brandeis ID card. To get your official ID card, please come to Kutz Hall between 9:00 a.m. and 4:00 p.m. and be ready to take your picture! Your Brandeis ID will have your meal plans loaded, as well as the optional debit plan, aka WhoCash. The ID card is used as a form of payment for dining and printing services, as an access card to residence halls and athletic facilities, and as a library card. Your first is on us; replacements are $10.